Konami’s popular dating simulator returns next year with a new entry in the series, along with three limited edition 3DS XL designs. New LovePlus+ will feature new story scenarios and locations to visit, and will also be available in a deluxe package. 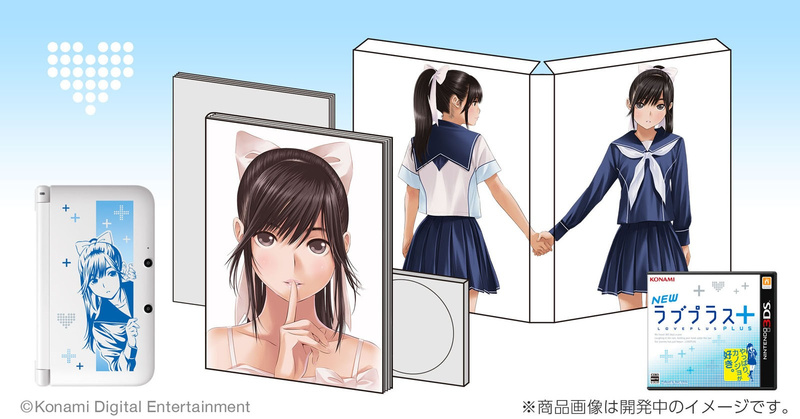 “The Manaka Deluxe” set of New LovePlus+ includes a copy of the game, a 40 page booklet, illustrations, and a 10 minute CD of the character Manaka intimately talking. The two other deluxe sets featuring characters Nene and Rinko will receive the same treatment. Each edition will cost 32,000 yen (US$320) and will be available in Japan for pre-order from the 8th of December onwards. As for the West? Maybe an import will be necessary if you want to play this. A dating sim video game sounds so... lonely. "and a 10 minute CD of the character Manaka intimately talking." Please tell me that this is a typo, lol! I just noticed something. Dating sim games are far more popular in Japan then anywhere else (as far as I know anyway), and yet in America (not sure about Europe or Australia) a typical image of a gamer is a guy alone in a basement. Unless this stereotypical idea is also widespread in Japan I can't help but find the whole thing rather strange. @WingedSnagret ur right, all of the rather underdressed sims are japanese, arent they? well, heres to hoping they never come here! Not just an import of the game but an import of a console too, God only knows if it's region-free, well an otaku can hope~ Import Import Import Import~! @Yuu_tan97 "God only knows" pun? Looks pretty similar to Bravely Default to me. I would love to play this game if I had the cash lol. But good on them. Well no one's said it so I will.... $320.00!? Are they out of their minds? What's made in Japan sometimes needs to stay in Japan! I think I'll stay in the real world instead of this. Sounds a bit naff and more suited to sad individuals that get their "romantic" release from digital characters. No thanks. My girlfriend would kill me. @shigulicious The game has a function where you can input your email and receive emails from your virtual girlfriend. Seriously. @Gioku you think they'd be taking it too seriously at that point? It appears you have missed THIS! http://m.youtube.com/watch?v=hsikPswAYUM&desktop_uri=%2Fwatch%3Fv%3DhsikPswAYUM now this is taking it too seriously. Bisjdjfjnffjjfmfk! Isn't this the game that made the news for the Japanese dude marrying his DS? EDIT: Just saw Remisio's link. Yes it is. @Tobias95 lol, that's DEFINITELY not happening. not a single game in the series has been officially localized. @Gioku I don't see anything wrong with playing dating sims. If people can casually wear t-shirts with bikini girls on it, then they're definitely free to play Loveplus out in the open (which shows far more respect to the female gender). I'd do it, at the very least! Nobody has the right to badmouth it. @Remisio Okay, this does cross the line to loss of reality, but that's also partly japans fault. @linktothepichu Boo! Every console game deserves localization! @Domon Its never too late to start. At least I would tried it (not sure if I would like it) but it seems nice. @Tobias95 I've played the first game in the series. There's way too much voice acting/text (that NEEDS to be dubbed to keep the atmosphere of the game) and too little of an interest outside Japan for these games to ever be localized. @Domon Do you get to wash and walk your girl? I'm crossing my fingers. I've always wanted one of these! I live in my basement and have been waiting years for a 3DS sequel! My puppets told me it will never come, and my DS LovePlus wives have been telling me that it couldn't get better than them. It's finally here!! @shigulicious I would play these types of games for the story line itself not for.. the fan services it offers. Who needs New LovePlus when we have Namco High coming! A dating game!? With a CD of a character talking!? For $320.00!!? Nope, I'll pass, but I do love anime though. @Kaze_Memaryu I have to agree. Games like Loveplus, the strictly non R rated doing sims, show a good deal of respect towards female characters and have well thought out stories. Not to say that if there is any Mature content that they are not at all respectful as many of those games have well thought out stories that are often adapted into Anime. @Kaze_Memaryu I have all the right in the world to criticize it if I want it 's because of dating sims that Japan's population is literally decreasing. In fact more than one person has married themselves to their LovePlus girlfriend, and Japan even has vacation resorts that take this stuff seriously. @NightmareXIV Japan's population is literally bursting at the seems and could do with some decreasing. I would even go so far as to hypothesize that the reason that their culture has shifted towards non-conceiving couples or outright abstinence is an evolutionary response to overcrowding. At any rate, I doubt anyone in Japan is seriously worried that they might wake up some day and think "Oh my God, where did all the people go?" @Dyl_73 You sir, will surely get "jumped" by Otakus and anime fans alike. I'll just make a tombstone just in case. Already pre-ordered my Manaka set from Play Asia! As a girl, I find the LovePlus series endearing and it's a good tool for showing how to properly treat women. There is nothing sexual or maturely themed in the games at all. I import them for 1. Collectibility and 2. use as a practice aide for studying Japanese since I take lessons (have an entire bookshelf's worth of imports for ds, 3ds, vita and ps3). Oh, and those saying the dating sims are responsible for the declining birthrate need to do their research. Japan is restricitive to women that want progressive careers (once married, women are more often than not kept at the same position at their job. Once pregnant, they are pretty much expected to leave the workplace and become typical housewives) and both genders are finding it bothersome to have relationships at all outside of casual flings. This is just one of the multitude of reasons for the declining birthrate. Otakus are not the sole reason this is happening. @NightmareXIV That's absolutely not true. In addition to the accurate explanation from @CaviarMeths , there's a different problem: lower marriage rates. But even that can be tracked down to japan putting young men under insane pressure. They have to be respectable, politically correct, career-driven business guys. And only performance matters on the market. Increasingly more men cannot handle this increasing pressure, marking their downfall. And men who have no job/qualification have a hard time finding a lovable woman to marry, since their families are often against it. At the same time, women rarely ever get a chance to advance their career because of the old-fashioned housewife expectation from society. Women are often left with much less respect than men, and once they've become part of a family, they have no other choice than giving up and raising the children since men are granted higher career chances. That's what drives young people into dating sims, which have both genders as target audiences. Dating sims contain the ideal image of romance that barely exists in japan anymore. And they tell intense, emotional stories that broaden one's understanding for other people. @NightmareXIV lol no, It is more than likely to be the result of higher expectations of young adults and a willingness to further their career first before starting a family. It also has to do with economic difficulties as one kid does cost a bit of money to raise and support in a big city environment. @KeatonTS well it comes with a 3ds XL soooo...With the extra content and the game it makes sense. I heard handheld games have a higher price in Japan as well. Also, currency and costs don't always directly translate across different countries. In Japan things can get expensive due to a big city environment and it being an island nation. 1. People who say people who play this game are sad and should just get a real girlfriend. That's like saying people who play Harvest Moon are sad for not actually going out to buy a farm or people who play sports games for not actually buying a race car or playing professional soccer. 2. People who actually quoted that 1 guy who "married" Nene as a reason this game or dating sims are bad. Not only is this an isolated incident, who are you to tell other people, who are not hurting anyone, what they should and shouldn't be doing to be happy? You might as well be telling people they shouldn't be in homosexual or cross race relationships because you believe it is wrong, when once again, nobody is hurt by it, you just believe you have the right to be telling other people who are not hurting anyone by their actions, what they should and shouldn't be doing to be happy. 3. People who blame dating sims for Japans decreased birth rate. Whether this is a long term problem for Japan aside, you act as if there is something seriously wrong with people if they'd rather spend their time and money enjoying themselves instead of investing a huge portion of their life and money raising children. What, is what for the U.S., does, for example, better? Where the government encourages the continuous birth of children through benefits no matter how poor someone is? This is that country that has massive unemployment we're talking about because there are more people than there are jobs for, and people are demanding more money then the market rate for the job despite that. here's a thought, maybe if you don't have the time or money to raise children properly, you should use contraception and not have children. You may say it politically incorrect to say so, but it is statistically true that poor people tend to have much more children than people with a moderate income and up, because poor people typically tend to be uneducated, and uneducated people tend to make poor decisions like having lots of children they can't support or properly raise. @Senario but i thought they just listed a US price conversion in this article? and what the heck is a 3DS X ? o-o ...or wait. you could mean XL. @DarkKirby The hard, cold truth. This is the kind of mindset I appreciate!